Seasonal Occurrence: Common in the spring, less common in summer. Occasionally may be found in other seasons. Nests in our area. Profile by Vicki Stittleburg: Summer Tanagers are medium-sized, chunky songbirds with big bodies and large heads. They have large, thick, blunt-tipped bills. The strawberry-colored male Summer Tanager is the only completely red bird in North America. Adult females have olive-green upperparts and mustard yellow underparts. First spring males may have varying patches of yellow and red. Summer Tanagers are bee and wasp specialists; they feast on the insects year long without getting stung. They catch bees and wasps on the wing and kill them by beating them against a branch. Before consuming a bee or wasp, they rub the insect on a branch to remove the stinger. 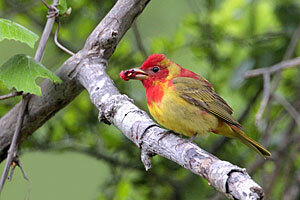 Summer Tanagers will also break into wasp nests to eat the larvae inside. Observing Summer Tanagers can be challenging as they typically move rather slowly in the treetops, often remaining hidden among the leaves. Listen for these birds in forested areas. Both sexes have a very distinctive chuckling pit-ti-tuck call note. 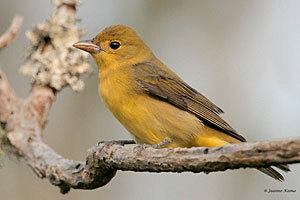 Summer Tanagers are common in the Houston area in the spring and also nest in our area.